I wanted to let you know just how much we enjoyed our trip to Scotland. The first part of the trip that you set up was just perfect. The golf, the staff, the lodging, all were top notch. I certainly couldn’t have done it without you. It was a pleasure working with you, meeting you, spending a couple of days with you. Hopefully, we get the opportunity to work together again. I look forward to that day. Thank you for all of your help in organizing our trip. 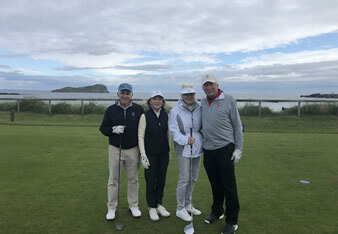 My brother and I had such a fantastic visit to your city – and all the folks at Links Golf were so kind to us. We hope to visit again soon! Take care and best regards. This is just a quick note of thanks for putting together our trip. Reggie, Marc, Melissa and I had a great time. The combination of great courses, wonderful accommodations and the perfect weather made it a memorable trip. None of this would have occurred without the outstanding staff you have assembled. Starting with Marion who was always very responsive to our questions and requests during the planning stages and with the outstanding effort by both Sam and Cameron. They both were always on time, did their best to accommodate us and were very pleasant to be with and to talk to. We greatly appreciated the personal service we received by all involved. I would like to thank you guys for putting together a memorable adventure for me and my guests. Word has it that Anne, Lynne and Sean enjoyed their vacations immensely and that is due directly to your organization skills and your consideration toward others. Again, thanks for all your hard work and I’ll be in contact again soon. Thank you for your assistance with our visit to Scotland. We really appreciate you arranging our golf trip in Scotland as well as your kindness and speedy response to all our requests. We had a wonderful time.